TenX is already issuing TenX cards (VISA AND Mastercard). PayPal has nothing to do with the cards. So, they are issuing already. Did someone get a card already? The TokenCard Alpha (MVP) will start on the 02. October. Bitcointalk is not beeing used by the Team but is rather a place for people to discuss the Project. The Team is alive and well and concentrating on bringing out a Product for the Alpha Test on the 02. October. You can follow the progress on different Medium Blogs of people involved, checking out Reddit or by joining the Slack. These guys have lot to prove. God, I'm not surprised. This project seemed DOA with all the screw ups Mel and his team did. I still hope they can pull it off, but seeing how incompetent the team is I'm loosing my faith. Will have to hold now regardless, don't want to sell for a loss. The slack channel doesn't work and other links are just old news. And monaco has no chance against Tenx imo. This company doesn't even have a face book that I could find. And digix already partnered with Tenx. Tenx just had a live face book answering questions. Maybe this is a good project but I highly doubt it. Tenx has big wig investors. They have the money and the team to make it work. Not sure about this team. 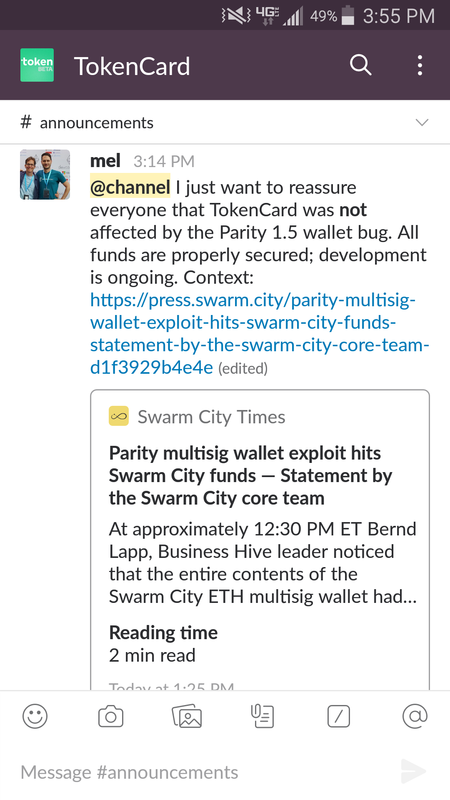 The TokenCard slack channel is working just fine. There was a lot of Slackbot scams going on so the team disabled the registration of new Users in Slack for the moment. We are considering switching from Slack to Discord. The developer Team is far from incompetent. New Alchemy was founded by Bitcoin Foundation Devs and they are a Member of the Ethereum Enterprise Alliance. Be assured that they will deliver an amazing product. I truly hope you will prove me wrong. TokenCard TKN moved from Slack to Discord. "Due to the recurring scam attempts that are happening all across Slack, we've moved our community engagement channel to Discord. You can join here: https://discord.gg/8pvC4D"
Tokencard joins the Enterprise Ethereum Alliance ! "TokenCard puts the power of the Ethereum Economy in the users pocket. Within the Enterprise Ethereum Alliance TokenCard can provide members with a vital service that can maximise general public access to their platform."